CM Magazine: Rapunzel and the Billy Goats. (Tadpoles: Fairytale Jumbles). Rapunzel and the Billy Goats. (Tadpoles: Fairytale Jumbles). Hilary Robinson. Illustrated by Simona Sanfilippo. St. Catharines, ON: Crabtree, 2013. 32 pp., pbk. & hc., $8.95 (pbk. ), $19.36 (RLB.). ISBN 978-0-7787-1158-2 (pbk. ), ISBN 978-0-7787-1154-4 (RLB.). Then he scrambled up the braid. and stopped to pick a flower. and rode up to the tower. "Please help me get out of here!" and how she lived in fear. Rapunzel and the Billy Goats is a mash-up of two fairy tales, Rapunzel and the Three Billy Goats Gruff. 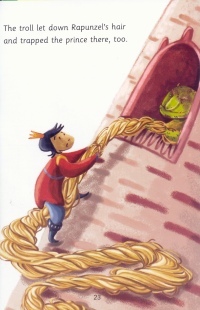 Rapunzel is locked in a tower where she is kept prisoner by a wicked troll. The troll also blocks a bridge, stopping the billy goats from ever getting across. When a handsome prince finds Rapunzel, the vicious troll cuts off Rapunzel's hair and leaves her in the woods. The goats take care of Rapunzel while the prince is tricked by the troll and is thrown into a patch of blinding thorns. Hearing Rapunzel's song, he finds her and the goats, and they live happily ever after. The idea of mixing two fairy tales together to create a new story with a unique twist is intriguing. The result, Rapunzel and the Billy Goats, fails, however, to accomplish much. This tale is basically the story of Rapunzel, with a troll instead of a witch. 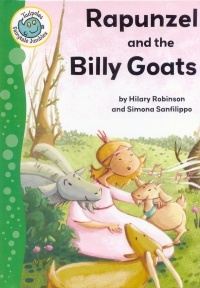 The goats, themselves, don't play a significant role in the story, and aside from the characters and the presence of an unused bridge, there is nothing of the Billy Goats Gruff storyline in this mash-up. Unfortunately, even the Rapunzel story, which makes up most of the tale, is vague and without any true resolution. Rapunzel gets tossed out of the tower, and the troll just leaves without being defeated or tricked in any way. The full-colour illustrations by Simona Sanfilippo are playful and bright, adding to the cheery tone of the story as a whole. Some of the images do not exactly portray what is written in the text, however. At one point, the reader is told that the prince has been blinded by a thorn and only that he regains sight when Rapunzel cries into his eyes. The illustrations show no difference between the prince being blinded and him having sight, and when he is stumbling sightless through the forest, he is depicted with a smile on his face. For readers using the images to help discern what is happening in the text, this attempt at keeping the story as light as possible detracts from the importance of the images as a learning tool. This story might be useful for classes studying fairy tales. Readers, if familiar with both Rapunzel and the Three Billy Goats Gruff, can go through this tale and separate the two stories, explaining what is missing from each tale and what changes have been made. As a primary source for the storylines, however, this book should be avoided. Rapunzel and the Billy Goats is a simplistic rendition of two classic fairy tales. While the fun illustrations and easy rhyming scheme may appeal to some readers, the lack of a cohesive mash-up of the two stories, and the nearly complete avoidance of the darker aspects of these tales make this story unnecessary for many audiences. Groups can use this mash-up to compare the two original tales, but a firm knowledge of both Rapunzel and the Three Billy Goats Gruff is needed to make the best use of this jumble. Meredith Cleversey is a librarian in Cambridge, ON. She loves to read, write, and live in a world of pure imagination.